Introduction: Progression of cancer requires the growth and invasion of the tumor at its parent site as well as metastasis. Recent studies have shown that tumor cells can aggregate platelets in vitro (a process termed tumor-cell-induced platelet aggregation [TCIPA]), and this aggregation correlates with the metastatic potential of cancer cells in vivo. Platelet depletion or even an inhibition of TCIPA reliably diminishes metastasis. Furthermore, tumor cells bind platelet adhesion receptors of circulating platelets to metastasize more effectively. Studies say that malignant tumors to interact with platelets in the above fashion secrete platelet activating factors which raise the platelet count in malignancy. The study undertaken aims at comparing the preoperative and postoperative platelet levels in patients with benign and malignant neoplasms. 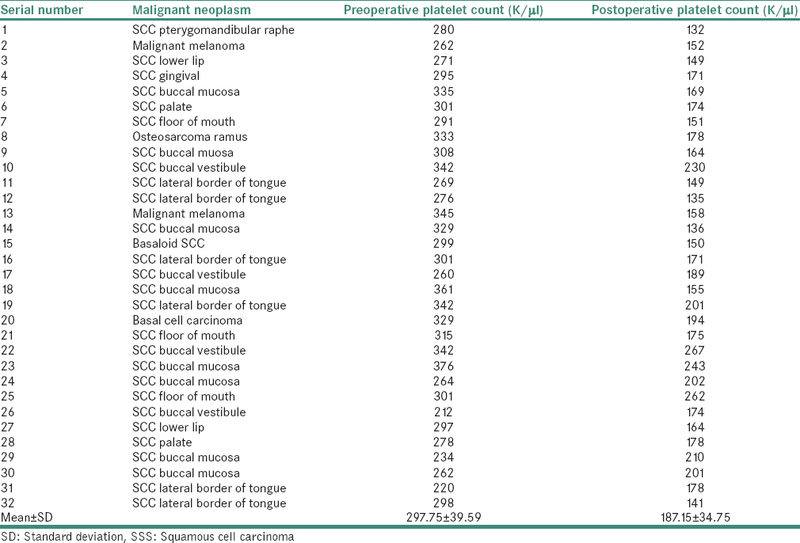 Materials and Methods: With an appropriate sample size of patients with benign or malignant neoplasms as per the inclusion and exclusion criteria, a platelet count presurgically and the 7th day postsurgically was advised. 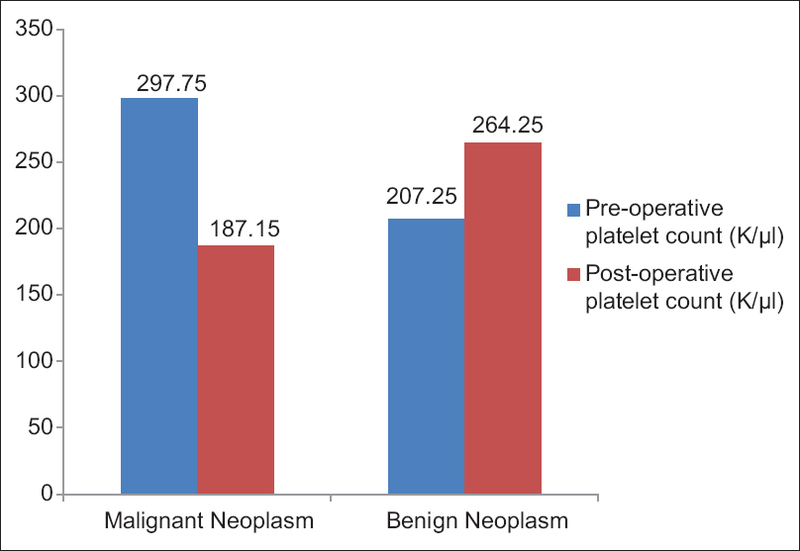 Results: In case of patients with benign neoplasms, the postoperative platelet count showed a significant rise attributed to a normal healing response, while in patients with malignant neoplasms, the platelet count appeared to fall down significantly due to the effect of tumor removal and therefore a diminished production of thrombopoietic cytokines. The results obtained were thus consistent with the theories of tumor cell-platelet interactions proposed in the recent literature so far. Conclusion: Postoperatively, the platelet count rises in the patients with the benign tumor as a result of a normal healing response while those in patients with malignant neoplasm apparently appears to fall down due to the effect of tumor removal thus diminishing the production of platelet activating factors. Platelets have been known to us since eras as one of the major cellular fragments in the circulating blood, performing their chief function of forming the primary hemostatic plug; later providing a surface for the coagulation factors to form the secondary hemostatic plug and ultimately maintaining surveillance in the blood vessel continuity. Thus, this is an obvious “life-saving” role of platelets. However, in the recent past, a darker side of platelets has also come into play, and that is, their role in cancer progression. Various research studies have identified platelets as one of the role players in the spread and progression of cancer, by helping the cancerous cells to evade the immunity and metastasize. Despite the major advancements in the basic biology of cancer and the novel therapeutic implications, cancer remains as one of the deadliest threats to humanity. Thus, every factor that has been implicated or is supposed to be implicated in the progression of this disease is needed to be studied further in depth for the likelihood of developing better curative measures. So, taking into consideration the need to work against deadly cancers and the role being played by platelets in the spread and progression of such cancers,, the following study was undertaken wherein the platelet counts were compared preoperatively and postoperatively in patients with benign and malignant neoplasms. The study population included patients who were histopathologically confirmed to have either a benign neoplasm or a malignant neoplasm, with no history of ecchymosis and petechiae on general physical examination and admitted for a surgical interventional therapy with no history of adjunctive chemotherapy or radiotherapy. Care was taken to exclude those patients who were transfused blood before, during or after the surgery that would result in a false platelet count. Also were excluded those patients who were under medications that would have in any way altered the level of platelets in the circulating blood. Other factors such as the half-life of the postsurgical medications and their any possible effect on platelet counts were also taken into consideration, and the patients who were on prolonged postsurgical drugs that would have altered or affected the platelet counts were also excluded from the study. Thus, overall care was taken to include only those patients who were relieved of all the confounding factors. The sample size was calculated using the Online OpenEpi Software Version 3.03a (Aurangabad, India), and 48 patients who met the above inclusion and exclusion criteria were selected for the study. Among these, 16 patients were diagnosed with a benign neoplasm and 32 with a malignant neoplasm. The patients in the study group were advised to undergo a platelet count 2–3 days before the surgery and 7th day postsurgically. During the entire span of the study, the same Cell Counter was used for all the patients to avoid any technically induced deviations in the platelet counts. These counts were recorded and computed, and a paired t-test with the help of Online GraphPad Software was applied to the data generated for both the benign and malignant neoplasm patients. The comparison was made between the preoperative and postoperative platelet counts in both the independent groups of benign and malignant neoplasms. The study was approved by the Institutional Ethical Committe, and a written informed consent was obtained from all the patients included in the study. 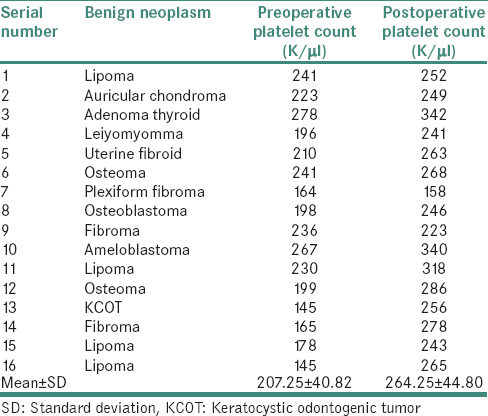 The mean preoperative platelet count was 297.75 K/μl and the mean postoperative platelet count was 187.15 K/μl in patients with malignant neoplasm [Table 1] while in patients with benign neoplasm, the mean preoperative platelet count was 207.25 K/μl and the mean postoperative platelet count was 264.25 K/μl [Table 2] the difference in the pre-operative and the post-operative levels being statistically significant (P< 0.0001) in both the cases [Table 3] and [Figure 1]. From the above-obtained results, it was evident that there was a rise in the platelet count postoperatively in patients with benign neoplasm while a fall in those with malignant neoplasm. The reason behind both the phenomenon can be justified as follows. In normal physiology, the platelet count is maintained at a particular required level with the help of thrombopoietic cytokines and remains unaltered unless there is a disease or a greater demand., In case of malignant neoplasm, the malignant cells themselves secrete these thrombopoietic cytokines, and their levels are thus higher in malignant neoplasm patients. These higher levels of thrombopoietic cytokines thus result in increased production of platelets. Thus after the resection of the tumor, the part of thrombopoitic cytokines that were being secreted by the tumor cells fall, and subsequently, there is reduction in the production of platelets. This gives an impression of falling count of platelets postoperatively. The raised levels of platelets preoperatively in malignant neoplasm conditions help in cancer progression by the following mechanism. The α granules in the activated platelets secrete various pro-angiogenic and angiogenic proteins like platelet-derived growth factor, vascular endothelial growth factor and angiopoietin-1 that help in the formation of new vascular channels around the malignant tumor. To add to the complication, recent studies suggest that platelets appear to be essential for regulating tumor vasculature hemostasis and for preventing intratumoral hemorrhage. This new effect is independent of the platelets' capacity to form thrombi and instead depends on their granule secretion. Platelets help in granulocyte recruitment by the secretion of chemotactic factors for the granulocytes. Granulocytes may further inhibit or promote the tumor growth and metastasis depending on the microenvironmental cues. Studies have shown that specific inhibition of platelet-derived signals or platelet-granulocyte interactions might limit metastatic progression by preventing the formation of the early metastatic niche. Thus, the role of platelets in cancer progression is certain, and the results obtained in this study seem to be paralleling the mechanisms involved in the same. Another justification for the raised thrombopoietic levels in the presence of malignancy is that the platelets get consumed at a faster rate while rendering their help in tumor metastasis. Thus, their binding to the thrombopoietin is reduced resulting in its lesser clearance and a subsequent rise in the levels. This rise, in turn, acts over the bone marrow to produce more platelets and the cycle goes on. In case of benign tumors, there is no additional secretion of platelet count raising substances like thrombopoietic cytokines and platelets that are present preoperatively are the ones that are formed due to the normal physiological secretions of cytokines. After surgery, there is no reduction in these platelet-producing substances. Rather a phenomenon of wound healing that takes place after any other surgery renders a rise in the platelet levels postoperatively. In patients with malignant neoplasms, the postoperative platelet count should seem to fall down the previous levels. No change or a rise in it can be suggestive of some residual malignant cells and a threatened prognosis. Furthermore, flow cytometry, fluorescence microscopy and intravital microscopy can detect the TCIPA in the circulating blood and indicate the higher possibility of discovering metastasis. Various sites in the platelet-tumor interaction can be targeted to reduce metastasis. The biggest progress has so far been made in the field of P-selectin inhibition by unfractionated heparin or certain low molecular weight heparins. This would inhibit the binding of platelets to tumor cells and further formation of TCIPAs that help in metastasis. Other receptors such as GPIb-IX-V, GPVI and Integrin α2β1 may also be targeted for the same; however, further research and clinical trials are demanded. Platelets have a catastrophic role to play in cancer biology. The study substantiates the research data available on the mechanism of tumor cell-platelet crosstalk by corroborating a raised level of platelets in the blood in the presence of malignancy and a fall after the elimination of it. Thus, with a firmer insight of this disastrous role of platelets in cancer patients, appropriate drugs can be formulated that can act as adjunctive cancer therapy without negotiating the beneficial role of platelets. Ghoshal K, Bhattacharyya M. Overview of platelet physiology: Its hemostatic and nonhemostatic role in disease pathogenesis. ScientificWorldJournal 2014;2014:781857. Buergy D, Wenz F, Groden C, Brockmann MA. Tumor-platelet interaction in solid tumors. Int J Cancer 2012;130:2747-60. Erpenbeck L, Schön MP. Deadly allies: The fatal interplay between platelets and metastasizing cancer cells. Blood 2010;115:3427-36. Drachman JG. Role of thrombopoietin in hematopoietic stem cell and progenitor regulation. Curr Opin Hematol 2000;7:183-90. Kuter DJ. Thrombopoietin: Biology and clinical applications. Oncologist 1996;1:98-106. Sasaki Y, Takahashi T, Miyazaki H, Matsumoto A, Kato T, Nakamura K, et al. Production of thrombopoietin by human carcinomas and its novel isoforms. Blood 1999;94:1952-60. Karpatkin S, Ambrogio C, Pearlstein E. The role of tumor-induced platelet aggregation, platelet adhesion and adhesive proteins in tumor metastasis. Prog Clin Biol Res 1988;283:585-606. Pietramaggiori G, Scherer SS, Cervi D, Klement G, Orgill DP. Tumors stimulate platelet delivery of angiogenic factors in vivo: An unexpected benefit. Am J Pathol 2008;173:1609-16. Bambace NM, Holmes CE. The platelet contribution to cancer progression. J Thromb Haemost 2011;9:237-49. Ho-Tin-Noé B, Goerge T, Cifuni SM, Duerschmied D, Wagner DD. Platelet granule secretion continuously prevents intratumor hemorrhage. Cancer Res 2008;68:6851-8. Labelle M, Begum S, Hynes RO. Platelets guide the formation of early metastatic niches. Proc Natl Acad Sci U S A 2014;111:E3053-61. Nurden AT, Nurden P, Sanchez M, Andia I, Anitua E. Platelets and wound healing. Front Biosci 2008;13:3532-48.